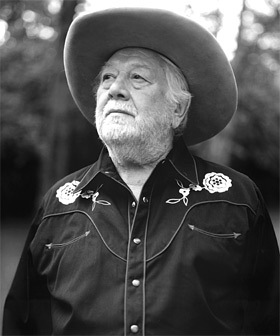 Here’s a re-post in honor of the late, great Cowboy Jack Clement (briefly interviewed below) and Jerry Lee Lewis: His Own Story – an excellent new bio by Rick Bragg (excerpt here). I’m not a Broadway musical kind of guy. I blame it on the gritty, gut-wrenching films I watched as a kid, like Mean Streets and The Deer Hunter. You won’t hear me burst into Oklahoma or The Impossible Dream, with arms flailing for dramatic effect. I’m also wary of most efforts to make the form more contemporary. Walked out of Phantom during intermission (wanted to leave earlier)… Found Mamma Mia! to be a promising new method of torture for terrorist suspects… Would rather put a rivet gun to my head than go see American Idiot. 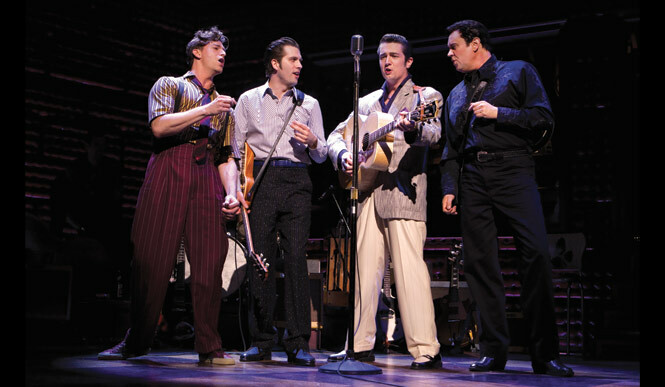 So when I was offered a few tickets to a touring production of Million Dollar Quartet, I initially demurred. But I’m glad I went, for several reasons. First, it’s a snapshot of a time in music I’ve always found fascinating – right after the birth of rock ‘n roll, and before Elvis had about 30 bad films under his belt. Second, all the principal actors in the production are real, live, breathing musicians who acquit themselves nicely on Fifties classics like Matchbox, Who Do You Love, Great Balls of Fire and Sixteen Tons. Third, it keeps the threadbare narrative conceits you can find in virtually every musical to a minimum. 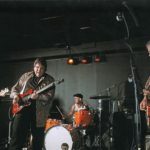 The production also benefits from the contributions of musical arranger/supervisor Chuck Mead, who co-founded one of the best bands to come out of Nashville in many years, BR5-49. For those of you who prefer Broadway musicals to Memphis rock ‘n roll, let me offer a little background (the rest of you can skip ahead a couple of paragraphs). Million Dollar Quartet captures an eventful night at a legendary site – Memphis’ Sun Studios, where producer Sam Phillips made music history with artists ranging from Howlin’ Wolf and Junior Parker to Elvis and Jerry Lee Lewis. But by late ‘56, Phillips was struggling to come up with his next big star, having sold Elvis’ contract to RCA the previous year for $40,000. Although Johnny Cash was tearing up the charts with Folsom Prison Blues and I Walk the Line, he couldn’t keep up with Elvis, who made his first appearance on the Ed Sullivan Show on September 9, 1956 (with an amazing 83% of the nation’s TV audience). And Carl Perkins was still fighting his way back from a serious car accident earlier in the year. That was the setting on December 4, 1956, when Elvis – joined by paramour du jour Marilyn Evans, a showgirl from Vegas – just happened to be back in Memphis for the holidays. 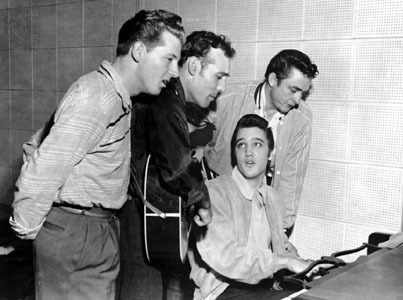 On a whim, Elvis and Evans decided to stop by Sun Studios, where Perkins and special guest Lewis were working on a few numbers (Matchbox and Put Your Cat Clothes On). And, depending on whether you believe the Man in Black or roots music aficionado Peter Guralnick – author of the definitive book on Elvis, Last Train to Memphis: The Rise of Elvis Presley – Cash was either there when Elvis walked in the door or was summoned by Phillips to show up later. 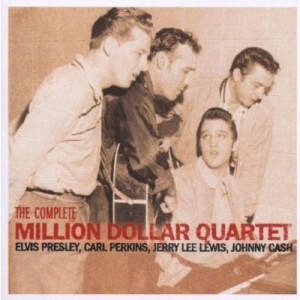 Regardless, it marked the first and only performance of the so-called Million Dollar Quartet of Presley, Perkins, Cash and Lewis – and Sun producer and engineer Cowboy Jack Clement had the tape rolling for posterity. The folks responsible for the musical certainly shared Escott’s point of view, but they also knew the events of 12/4/56 didn’t exactly lend themselves to an extended dramatic treatment. So they introduce a few other story lines that didn’t come into play during the actual quartet sessions. For example, Marilyn Evans became Dyanne, a swinging chanteuse who performs Fever and I Hear You Knockin’. Johnny Cash announces his departure to Columbia Records, even though he stayed with Sun for another two years. Perkins clashes with the flamboyant newcomer Lewis and then confronts Phillips for letting Elvis appropriate his hit song Blue Suede Shoes. And Phillips reminds everyone that he was responsible for giving them their first breaks. T.Q. : Did you see the musical? What did you think about it? J.C.: Yeah, I saw it a couple months ago. I liked it… They even had me sing one of my songs at the end – It’ll Be Me, which Jerry Lee did. 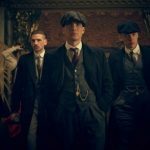 It’s a great show… you should go see it. I did… and I agree! The play made it seem like there was some tension between Perkins and Lewis. Was that what you recall? Did you feel you were part of something historic? Sort of, yeah… especially when Elvis came in. He was really diggin’ Jerry Lee’s stuff on the radio. There was a bunch of jammin’ on old gospel songs like Down by the Riverside as I recall. They all knew those old standards. It went on for quite a while. Sam went next door to Taylor’s Restaurant, where they had a juke box with a lot of Sun singles. Sam took care of a lot of business at Taylor’s – he even had an office there. (Back at the studio) I heard them talkin’ and jammin’ and thought I’d be remiss if I didn’t turn on the tape machine, so I moved a couple of mikes around and let it roll for a couple hours. Sam came back, saw what was going on and called the paper. That’s how the photograph happened (at the top of our post). No one paid much attention to the tape… It sat on the shelf in a metal container and was there when I left a few years later. Then someone bootlegged it and it became an album. They played a lot of good stuff that day, pickin’ and singin’ those old songs.